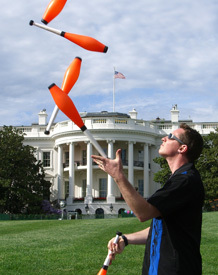 This show is a heady mix of high-energy juggling and crazy offbeat comedy. 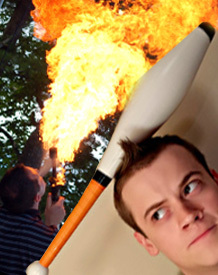 His fearlessness and constant off-kilter banter makes his show a must for audiences of all ages. A thrilling combination of comedy and technology. AudioBody’s performance is an electronic journey into an unknown realm of seriously spectacular entertainment. 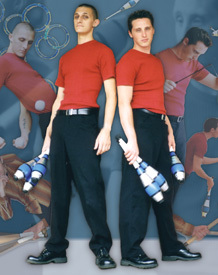 The Atlantis Resort calls them “AMAZING!” and Inside Edition has dubbed them "One of the hottest juggling acts in the country!" 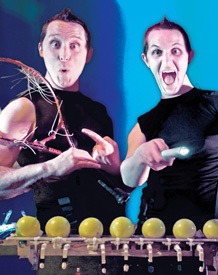 Featuring fast paced juggling routines, off-the-cuff comedy, dangerous props, escape wizardry and insane stunts, this show is non-stop entertainment from start to finish!